The demo opens with Arle and Carbuncle chatting amongst themselves, unfortunately I was unable to decipher anything they were saying other than the “AHHHHHHH!” when the duo were sucked up and tossed into a new world. At this point the game starts with a simple tutorial introducing the basic features, how to explore the over world and the first battle. 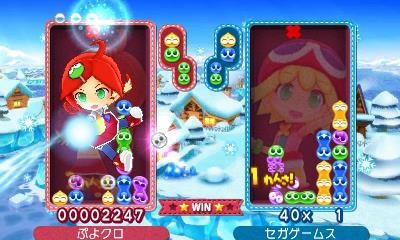 For the first battle there was only one enemy attacking me, the upper screen showing the enemy whilst the bottom 3DS screen was used for the standard Puyo gameplay. Unlike traditional Puyo gameplay, the bottom screen would already be filled with puyos to chain together and the more chains the player can pull off the higher the attack damage will be towards the attacking enemy. After a relatively straight forward battle the player is then directed to the exit for the area. I was then greeted with a map that showed the whole world of the game I presume, but I was only able to select one of two areas. The large forest I had just ventured from or a village full of cartoony mammal people (Who looked like raccoons to me) unfortunately I was unable to decipher if there was anything other than talk to the towns people to do in the town. After seeing if I could collect any items from pots and boxes (as you do in RPGs) I left the village and hit the map again, this time there was two areas to select from the forest area and I promptly explored the area I hadn’t seen before. Unlike the other area, this one was had enemies and treasure chest to open but in terms of design there wasn’t anything else to it. I suppose as a forest there wasn’t an expectations of puzzles to solve and it remains to be seen if this is in the full game. 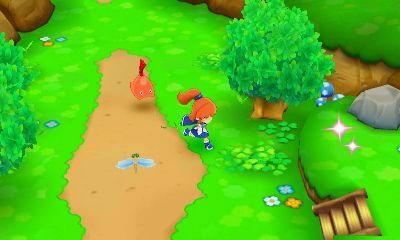 In terms of initiating a battle, players must confront (or avoid if you wanted to) enemy NPCs that populated the map, as Arle’s run speed was greater than any enemy characters I came across, avoiding them was no problem but I’d imagine this was due to the demo being set early in the game and I’m hoping enemy speed increase the further you get into the game. There was also a map on the screen showing you where all the treasure chests were to be found and from what I could see the area itself was fairly straight forward. After a bit of exploring and ransacking I decided to collide with an enemy in the area and began my first proper battle. 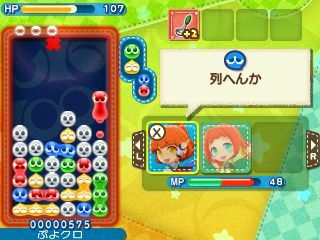 Like before players are giving a pretty set layer of puyos with a Puyo being dropped by the player, however this time there was two enemies on screen which players can chose to attack with the left and right bumpers on the 3DS. 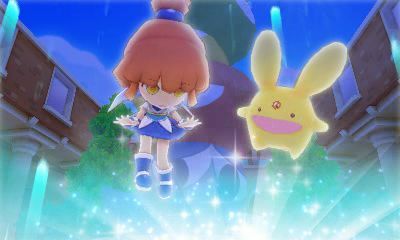 I was also granted a new party member for this battle and special attacks were unlocked, however I could only use Arle’s in the demo. Her special ability allowed me to remove on set colour of puyos from the field, a simple power but should definitely come in handy later down the game. The power also came with a cool down but no battle lasted long enough to allow me to reuse it. 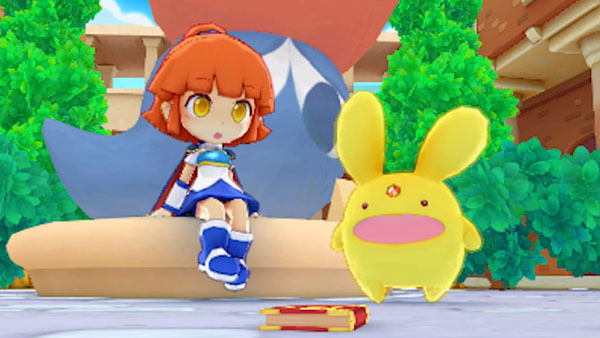 Thinking about the potential for Puyo Puyo Chronicles, both in its strong points and possible short comings, has me curious. There’s no doubt going to be a large selection of characters in the title and as such I’m expecting some cool party mechanics, I only wonder how they can combine each characters special abilities with the battle system itself but the possibilities in what it can add to the puzzle gameplay has me excited, likewise despite the demo being overwhelmingly easy I’m sure this has to do with how early it’s set. The only question mark than left is the design of the dungeons, are they going on be straightforward in design or can we expect more? I’d say as far as my concern goes that was probably my biggest worry but I’m willing to wait and see how the team take it from here. 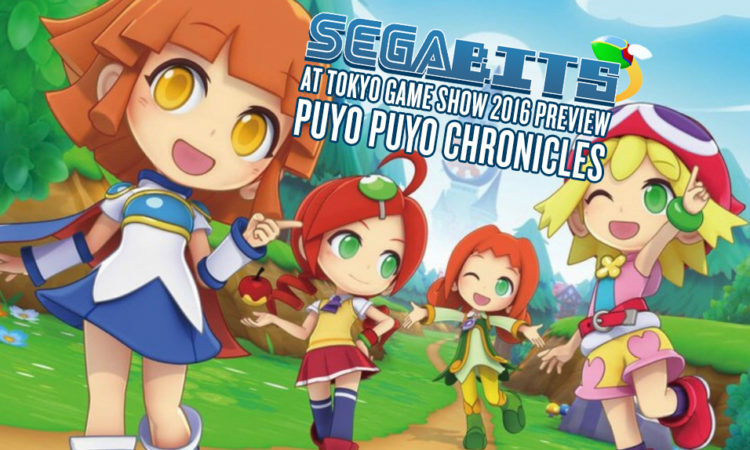 I must say out of all the games I tried at Tokyo Game Show, Puyo Puyo Chronicles was the biggest surprise at the show and that was despite being a Puyo fan. Yes Yakuza 6 was great and perhaps my most anticipated title of the year but I was expecting it, with Chronicles the mixture of colourful world, the Puyo gameplay we all know and love and the general music made for a delightful experience that even took me aback. For me it was just a joy to play through Chronicles and the combination of RPG elements with the usual gameplay was enough to make this game my second favourite at TGS. Fingers crossed and horse shoes shined that this title gets localised!